After a very difficult month Arsenal took on non-league outfit Lincoln City in the FA Cup 2017 quarterfinal at Emirates and they were odds on favourites to win the tie. Lincoln however made a game of it as they held Arsenal to 0-0 for most of the first half but were unlucky to concede at the stroke of half time when Walcott’s deflected shot found its way in the back of the net for opening goal. Arsenal scored their second of the day when Giroud made it 2-0 and pretty much settled the tie. 53′ 2 – 0 Olivier Giroud made it 2-0 after the break and Arsenal secured semifinal berth in FA Cup for the third time in four years. Arsenal lost their second leg of Champions League round of 16 tie against Bayern Munich 5-1 making it their worst European aggregate defeat of 10-2 and both players and the manager have been under massive pressure since that result. 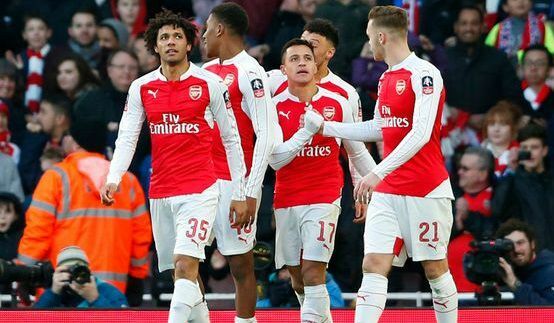 Arsenal are also languishing in the 5th place in the league and their is a great uncertainty surrounding the club. However this Saturday clash against Lincoln give them a superb oppertunity to getting back on track and restore some of the confidense going into the business end of the season. Team News & Lineups: Wenger is likely to start with David Ospina in goal while Mustafi, Koscielny, Bellerin and Keiron Gibbs to start in back four. Coquilin and Xhaka to start in central midfield roles while Ox-Chamberlain, Walcott and Sanchez to start in attacking roles behind Olivier Giroud. Regardless what team lineup Wenger start with we can expect an easy win for Arsenal but Lincoln can enjoy a great day at Emirates as they have already made history by becoming first non-league team to reach this far in the competition. Match Predictions: Arsenal playing at home should slice through Lincoln at Emirates and I fully expect a professional performance from Arsenal and reach their third FA Cup semifinal in last 4 years.